The ZenBook 13 and ZenBook 14 get Asus’ innovative NumberPad feature on the touchpad, while the ZenBook 15 sticks to a traditional physical numpad. Asus has launched a new generation of ZenBook laptops in India. It consists of the ZenBook 13, ZenBook 14, and ZenBook 15. The starting price for these laptops is Rs 71,990. Asus has launched a new generation of ZenBook laptops in India, which consists of the ZenBook 13, ZenBook 14, and ZenBook 15. The three new models go on sale on both online and offline platforms starting today. Online platforms include Flipkart, Amazon, and Paytm Mall. Prices start at Rs 71,990 (for the base variant of the ZenBook 13) and go all the way up to Rs 1,39,990 (for the ZenBook 15). As there’s no space on the keyboard to include a regular numpad, the ZenBook 13 and ZenBook 14 come with Asus’ innovative NumberPad, which is essentially a haptic numpad built into the touchpad. The ZenBook 15, on the other hand, is big enough and gets a physical numpad like on most 15.6-inch laptops. 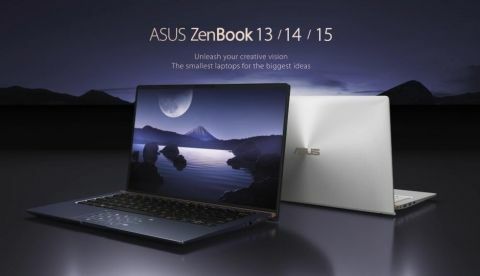 According to Asus, the ZenBook 13, with its 13.3-inch Full HD display, is more compact than an A4 sheet of paper and weighs 1.19 kilogrammes. The ZenBook 14, which features a 14-inch Full HD display, is also about the same size as an A4 sheet and weighs the same 1.19 kilogrammes. All three models come with Intel’s 8th Gen Core series of CPUs and PCIe-based solid-state drives for storage. For rendering graphics, the ZenBook 13 and ZenBook 14 get an optional NVIDIA GeForce MX150 graphics card, while the larger ZenBook 15 gets an NVIDIA GeForce GTX 1050 with Max-Q Design as standard. RAM options include 8GB and 16GB. Solid-state storage comes in 512GB and 1TB capacities. Ports on the new ZenBooks include USB 3.1 Gen 2 (both Type-A and Type-C), full-size HDMI, and a 3.5mm audio jack. According to Asus, the 50Wh lithium-polymer battery on the ZenBook 13 and ZenBook 14 is good for up to 14 hours of runtime on a single charge, while the 73Wh lithium-polymer battery on the ZenBook 15 is good for up to 16 hours of runtime on a single charge. All models in the new ZenBook series come with Windows 10 Pro or Windows 10 Home pre-installed. The three new ZenBook laptops are currently available in Royal Blue and Icicle Silver colours.